London 26.11.2012 - The "unacceptable face of capitalism", otherwise reported as involvement of some of the world's "most reputed" private financial institutions in money laundering, and aiding and abetting with terrorists, is shocking enough. But what if I were to give an example where boardroom greed is not part of the equation? What if I were to show that a Central Bank, of one European country, neglected its anti-money-laundering responsibilities, by clearing ill-gotten proceeds from extremely dubious characters starring in corruption rackets? What if I were to show that judicial authorities have disregarded anti-money-laundering legislation? Hard to believe? Think again. Translation of relevant part: "... (cash, "Bank of Spain" transfer or check) payment shall be made into account seized by administrator, to Viajes Marsans S.A Administrators, whose details shall be given to interested parties." retreat purchased by Derwick Associates for €24 mil. 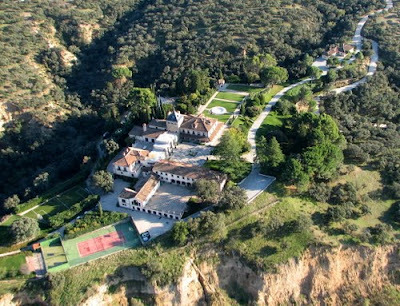 One of Diaz Ferrán's assets up for sale was a 1,600 hectares hunting farm, which reports in the Spanish press indicate was purchased by Derwick Associates. Another source reports that Alejandro Betancourt, who nowadays counts on the daughter of one of -paraphrasing Hugo Chavez- Spain's most rancid oligarchs as his wedding planner, had indeed bought El Alamín (pictured). But what does this mean in practical terms? Madrid's 12th Mercantile Court acts as administrators of Viajes Marsans, and auctioned a number of assets. Winning bids from participating parties had to be settled in one of three possible ways (cash, transfer, or check). The winning bid for the farm in question is cited as €24 million. It is unlikely that Derwick Associates paid for it in cash. That leaves bank transfer or check. It must be borne in mind that Derwick Associates incorporated in Spain 13th January 2011 with a capital of €10,000, and there it was, sometime later, offering €24 million in a sealed envelope. 2) pay into its own special-purpose administrator's account a €24 million check from Derwick, whose bank is legally-bound to have done relevant due diligence. Whichever way the payment was processed, there's legislation in Spain against money laundering. There's also a financial intelligence unit of sorts, responsible for ensuring that banks enforce a number of obligations in that respect. There's even explicit criminalisation of money-laundering in the Penal Code. The law leaves no room for interpretation: money laundering is illegal, and Cesar Batiz's excellent exposes in Ultimas Noticias leave little doubt as to the propriety of Derwick Associates contracts with the Chavez regime. What is astonishing about this, IMO, is that transaction didn't happen in cash between private parties (as is often the case in Spain), but rather it was a public auction, controlled by judicial authorities, acting as administrators of assets seized from a fraudster. The thought of said administrators disregarding legislation to prevent money laundering is beyond shocking. But what makes it even more so, is that the Bank of Spain (i.e. the Central Bank), as the clearing institution behind all such transactions, could have also failed in establishing the legitimacy of Derwick Associates' funds. So what, if anything, is Mr. Eduardo Torres-Dulce doing about it? If the enforcers are failing, what hope is left for Spain? London 23.11.2012 - Opened my email the other day, and found a LinkedIn invitation from Paul Babic, Smartmatic's Chief Marketing Officer. Just imagine my expression, after all the things I have written about Smartmatic over the years. I thought it was a slip, a case of sending something to the wrong person, though I did reply, with "Hi Paul, did you really sent me an invite to connect? ", expecting to never hear from him again. But it got better. Paul did reply, saying "Yes, Alek. I know we don't know each other personally, but we may have the opportunity to meet in the future. Cheers, Paul" At this point, I thought, anything could be expected, so I decided to play along. My next message was: "Actually Paul, I am glad that you have made this overture, for, as I am sure you can imagine, I have a ton of questions to ask about Smartmatic. As a marketing man, you'll probably know better than me the costs of bad PR. Smartmatic's actions in that front have been poorly, well below par, for a multinational corporation claiming to be a "world-class operation". So how about getting this conversation started, and dealing head-front with the many legitimate criticism that I and others have raised over the years?" To which this is what Paul replied: "Alek, in all fairness to you, I am afraid I would not be in a position to address your questions about Smartmatic. My involvement within the organization has been limited to product development and management, and more recently to business strategy. The PR side of marketing you refer to is not part of my function. However, if you would be interested in a conversation about how electronic voting (among other technologies) can benefit democracy, that is a discussion I would be very interested in having. I can share with you some of my own experiences (and all future challenges I anticipate this industry will go through), and I am sure you would be able to share many of your own." So here we have an admission, by Smartmatic's CMO, that the "PR side of marketing [I] refer to is not part of [his] function." A marketing guy in charge of "product development and management" is not something out of the ordinary, is it? 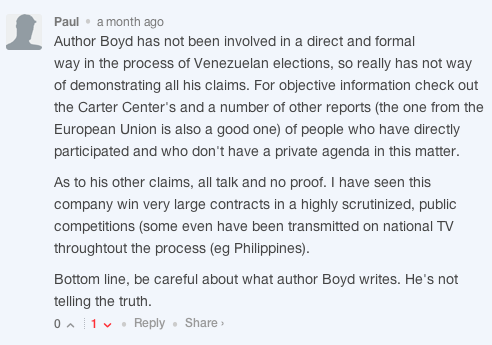 However, have a look at this comment in the Smartmatic article The Hill published recently. Could the Paul who wrote that reply to my article, be the same Paul who is now throwing a charm offensive? I would hate to think that this is another crude attempt from Smartmatic's marketing office. Anyway, I did send another comment: "Apologies for the delayed reply Paul. I think you have hit the nail with the claim about how electronic voting can benefit democracy, in fact, I am going to blog about it and try to assess the topic objectively. Hopefully you'll want to move the discussion to a more public venue." Paul said in his next reply "There have been some very good implementations, as well as some very bad ones. (The same applies to paper-based elections, by the way, some of which have worked very well and some have failed completely.)" Mmm, "very good implementations" eh? And "paper-based elections" that "have failed completely." Shall I start with very good implementations of electronic voting? Where might that be? I'd say in countries where all parties to an election can audit the entire system, as and when they please. Is that the case of Venezuela, a place that Smartmatic flags as one of its success stories? I don't think so. Is that the case in the Philippines? Filipinos don't seem to think so either. So to which success could Mr Babic possibly be referring to? A voting system, electronic or otherwise, is as good, or as bad, as those executing it, implementing it, as those in charge of it, as those making use of it. All of Smartmatic's involvements in elections around the world have been marred with controversy, when not with outright accusations of vote rigging. All of them. Regardless of location, culture, language, and people using the system. Chicago? A fiasco. Ditto Venezuela and the Philippines. So where's your successful example of "very good implementation" of electronic voting Mr Smartmatic's CMO? Be very precise in your next answer, if you could. And what's with the asking where I'm based? Why is that relevant? London 21.11.2012 - Derwick's little adventure gets more interesting the deeper I dig. What we have here is a Venezuelan company accused of corruption in Ultimas Noticias, and in other published Venezuelan media such as El Universal, El Mundo, Analitica, Reporte, Sexto Poder and numerous blogs. Yet they haven't touched any major publications. Why are the Derwick gang not suing Batiz and Ultimas Noticias? Batiz actually won an award for his reporting on Derwick's fraud. Perhaps Derwick realizes that the owner, Miguel Angel Capriles, is a very powerful and untouchable Chavez ally, going against him would probably cause Derwick's dissolution in an internecine chavista legal war they just can't win. Or perhaps it is something else, entirely. In my last blog post, I referred to how they may be using their lawsuit to nail a Chavez government critic. But it also addresses another problem. What they are likely afraid of is that their private bankers and money managers in the financial capitals could be getting a little restless about holding their accounts. After all, who wants to manage accounts from Venezuelans with dubious reputations? In the past, American banks have paid a high price for laundering ill-gotten South American wealth. 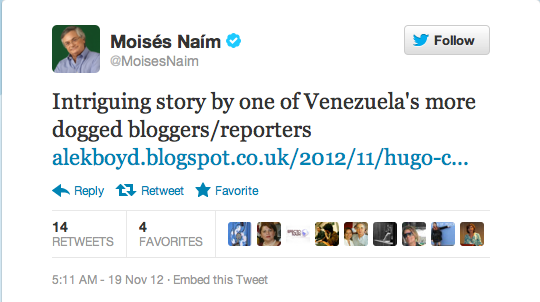 So why sue Batiz, Reporte, or Ultimas Noticias--in Venezuela or Florida-- if they know they would lose? Instead, why not sue a rather unknown website that's yet to establish its crediblity? This way they can point to the lawsuit, and tell any banker doing KYC: "you see, we have clean hands, we are victims of a conspiracy and a court determined that." That way they can lay to rest any concerns for their reputations in the future, and point to hundreds of millions of dollars in profits and say it is all squeaky clean profits, made in less than three years of honest work. Betancourt, Trebbau, Convit, Romero Lazo, and their partners evidently don't care about what's published in Spanish. But they are terrified of a breach in the digital divide between English and Spanish. Exposure abroad could mean no more weekends on the yacht in St. Tropez, no more brunches at the Knickerbocker Club, no more weddings in Ocala to show off the new helicopter to their cousins. What matters to them is what ends up in the English-speaking media, and I think there is a pattern here. The evidence suggests it: reputed fellow bloggers deleting posts, other bloggers that have written about it emailing me asking for advice owing to legal concerns, while yet others already in the crosshairs of Derwick. So, bloggers writing in English, get threatening letters from millionaire New York lawyer Hector Torres. Meanwhile, Ultimas Noticias and Cesar Batiz are simply invisible to them. Well, I have translated one of the Ultimas Noticias articles for the world to read. I include it below, and hope it is reprinted far and wide so that Derwick can cease its preposterous claims of a defamation campaign by some website, and can instead begin to address the elephant in the room: the allegations below aren’t from some ad hominem website, it is a thorough report from Venezuela's largest selling-newspaper. And it led to formal petitions from the newspaper for a thorough criminal investigation. But putting aside the many criminal allegations against the Derwick boys, matters of freedom of speech and the silencing of whistleblowers is something near and dear to my heart. Due to my exercising freedom of speech on issues -like this one- about my country, I was once the target of the Mayor of London. Well, guess what? Views similar to mine on Livingstone had been vindicated. In my next update I shall go through the lawsuit point by point. I do not know if Oscar Garcia Mendoza and his bank are behind Wiki Anti-Corruption, but regardless of that, what is undeniable is that the burden of proof is on Derwick, it needs to prove that the allegations against them are not true. This Kasowitz lawsuit is sure to be the focus of many stories, and I want to get ahead of it. Hector Torres's clients aren't building powerplants in Denmark, they are doing so in a narco-state, with a government ranked as one of the most corrupt in the world. And their subcontractor, ProEnergy Services, seems to restrict its work mostly to dodgy dictatorships. Just yesterday a new twist: two Caracas publications, La Razón and 6to Poder, reported that new Electricity Minister, Hector Navarro, has been asked directly by President Hugo Chavez to investigate the corruption scandal related to Derwick and its directors. Oh dear. I have been talking about the Derwick fraud to Cesar Batiz and other sources. One of the highlights thus far has been intellectual heavyweight Moises Naim tweeting my last report to his 51,981 followers. Derwick sued Oscar Garcia simply for tweeting a link. What is Derwick going to do now—sue Moises Naim too? But perhaps more gripping, since I started writing about Derwick, my blog is being visited often by the FBI, Homeland Security, Dept. of Treasury, Dept. of State. I haven't seen this many visits from US. government domains since my other site, vcrisis.com, used to get in excess of a 150.000 visits a month. This may explain their fixation with silencing anyone who has written about their exploits in English. The lack of experience did not prevent a firm from receiving 12 contracts for electrical work in 14 months. EDC, CVG, and PDVSA awarded the firm major projects in the midst of the power crisis. The firm has failed in five cases to meet the delivery date. Derwick Associates is registered in Barbados, Venezuela, and Spain. A company incorporated in Venezuela in October 2009, without any kind of experience in executing projects either for the public or private sector, received 12 contracts in 14 months for the construction of electrical works, including five that played a crucial role in ensuring electrical service to Caracas. Derwick Associates Venezuela, whose directors are young, with an average age of under 30, began to install one generator for La Electricidad de Caracas (EDC) in Picure, in the state of Vargas, on October 2, 2009. It appears from the website of the National Contractor Registry (RNC) that as of that date, Derwick was not registered as a company under the laws of the country. That registration took place on October 28, 2009, according to the commercial record. Less than a month later, the company signed another contract with the EDC for a job in La Raisa, state of Miranda. From March to December 2010, a period during which the electrical emergency decree issued by President Hugo Chávez Frías was in effect, Derwick won four contracts with the EDC, including Guarenas I and II, and five more with PDVSA and one with the Venezuelan Guayana Corporation (CVG), for a total of 12, five of which were supposed to be completed before this month. The only information available about the cost of the projects, which can be found in press reports and on the website of the Ministry of Electric Power, is that Picure cost a total of $130 million for 134 MW, and Guarenas cost a total of $211 million for 156 MW. Últimas Noticias wanted to know the details of the contracts, to which end we delivered a letter on 6 July at the headquarters of the National Electricity Corporation (Corpoelec) with a right to petition and timely response. An unsuccessful attempt was also made to interview the directors of the company. The only one who responded was the former president of the EDC, former vice minister, and current president of Bariven, Javier Alvarado Ochoa, but he did so via Elizabeth Moran, his communications adviser. She said that between 2007 and 2008 Corpoelec hired ProEnergy Services, a U.S. firm, to perform the electrical work. According to Alvarado's account, by order of PDVSA a Venezuelan firm had to participate in carrying out the projects executed by ProEnergy. For this reason they entered into an association with Derwick. Ultimas Noticias wrote to Brett Bettinger, representative of ProEnergy, asking him about his relationship with Derwick. He suggested that we pose the questions to the Venezuelan company. Advisors to Corpoelec and engineers involved in the projects, whose names are being withheld, confirm that Derwick subcontracted to ProEnergy. On its website Derwick describes itself as an organization "with a wide range of capabilities." "It's American," said a worker who works on The Raisa's projects. The same company has three names. In Barbados, where it was registered in May 2009, the company is identified as Derwick Associates Corporation. In Venezuela it is called Derwick Associates Venezuela, while in Madrid it is Derwick Associates International SRL. In all cases the names and relationships are consistent. In the register in Barbados, Pedro Trebbau Lopez, Leopoldo Alejandro Betancourt Lopez, Domingo X. Guzman De Frutos Lopez, and Edgar Romero Lazo are listed as directors. Trebbau, Betancourt, and Guzman live in La Lagunita, according to the Maisanta database. Their average age is under 30. The oldest of them, Leopoldo Alejandro, or just Alejandro, as he prefers to be called, at 31 years old runs Derwick Venezuela, sharing the role of director with Trebbau and Iker Candina, the only one in the group who is over 50. According to the register in Barbados, the secretary of Derwick is Trident Corporate Services (Barbados) Limited, a fund company that operates in tax havens in the Caribbean. The Spanish subsidiary of Derwick is on calle Príncipe de Vergara, Madrid. The journalist Sandra La Fuente, who helped with this report, went to that address. She spoke over the intercom with a man who had a Venezuelan accent. She asked him if it was the headquarters of Derwick. The man said no, and said that it was his residence. Derwick's first headquarters in Venezuela was The Pyramid Building, 2nd floor, suite 202, in Prados del Este, according to the mercantile records. The office is empty. The owner of the property is Edgard Romero Nava, ex-president of Fedecámaras and father of Derwick director Edgar Romero Lazo. Romero Nava said that for a year and half the office was rented to a U.S. company whose name he did not remember [added ProEnergy anyone?]. He noted that the lessee was not Derwick and said he was unaware that his son was a director of Derwick, as shown in the Barbados register. In mid 2010, National Guard officials visited the site in search of the previous tenants, who were gone. Romero Nava confirmed this, but was not in the country when it happened. Ultimas Noticias knew that on April 29 of last year, the president of the Union of University Professional Workers of Venalum, Manuel Diaz, submitted to the Senior Prosecutor of the state of Bolivar a request to investigate former Minister Rodolfo Sanz, who sent a fax from number 212 -977-7399 to companies purchasing metal produced by the CVG, requesting that sum of money involved in the transactions, a total of $500 million, be deposited in an account at Gazprom Bank of Lebanon. Diaz notes in the complaint that the phone number from which the fax was sent on September 4, 2009, belonged “to a private individual named Alejandro Betancourt.” A journalist from El Universal, Joseph Politzuk, tracked the number as part of a report published in June 2010 on the Gazprom Bank case. Upon checking it, he discovered that the address was none other than the same one that is registered as the headquarters of Derwick at the moment in the first commercial register. "They told me that it was the office of Alejandro Betancourt, who was an advisor to Minister Sanz," notes Politzuk. By June of last year, the directors of the company had already moved to the new headquarters in the PH of the Kyra building in Campo Alegre, Chacao municipality. In March, five months after winning his first contract, they paid BsF 4,800,000 ($ 1,116,279.06) for the property, according to the land register. But the new headquarters does not blot out other data in the story. 212-977-7399 was the same number that Javier Andres Alvarado Pardi, son of the former president of the EDC and former vice minister of Electricity Development, used when he exported a 1959 Porshe from the Dominican Republic to the U.S., as reflected on the website www.importgenius.com. Javier Andrés also listed, as an emergency contact address, the same building and floor where the original headquarters of Derwick were located, and where fax sent to CVG buyers was attributed to Betancourt. Furthermore, on Facebook, Alvarado is friends with Betancourt, Trebbau, and Guzman, among others. The coincidences do not stop there. Sanz and Derwick are not only linked by a fax sent in September 2009 from the location where the company's Venezuelan headquarters would be established a month later. The only power plant designed by Sidor, under the command of the former minister and member of Estado Mayor Electrico (see note tomorrow in El Mundo Economia y Negocios), began to be installed by Derwick in March 2010, with equipment, according to statements made to the press by Sanz, sold by Gazprom, the Russian energy company, which owns the Bank of Lebanon. Five months earlier, in October 2009, when Derwick was awarded the first of the 12 contracts, the president of the EDC was Alvarado Ochoa, who also lived in La Lagunita, according to the Maisanta database. The same official, on February 12, 2010, was appointed Deputy Minister of Electricity Development. On February 15, 2010, when the electrical shielding of Caracas was announced, Alvarado Ochoa had responsibility for all works that were required to achieve that goal. All the thermoelectrical work, other than the Termocentro Complex Generator (of which Duro Felguera was put in charge) and the two barges with generators, was awarded to Derwick. Article 51 of the Bolivarian Constitution of Venezuela provides for the right of petition and timely response. The failure of public officials to comply with this requirement can lead to penalties and suspension of their functions. Ultimas Noticias sent a letter to Minister Ali Rodriguez and the Communication Director of Corpoelec, Nelly Trujillo, and has yet to receive a reply. In the case of Derwick, we made attempts through various intermediaries to speak with Betancourt, Trebbau, and Romero Lazo. Only Guzman phoned us and asked us on July 28 to submit a list of questions. At press time, he had not yet answered our questions. For his part, Javier Alvarado did not clarify the relationship between her son Javier Andrés and the boys. The installation of 1,344 megawatts of power generation in seven states remained in the hands of a single company, Derwick Associates Corporation. In some cases, such as those contracted by PDVSA, the projects have been stalled for several months owing to non-payment. The firm listed as secretary of Derwick in the Barbados register (see documents on the web), Trident Corporate, served the same function for Petromarine Energy Services, the company from which PDVSA leased the Aban Pearl, the semi-submersible that after experiencing a near-shipwreck in August 2009 in Trinidad sank in May 2010 in the Gulf of Paria. London 19.11.2011 - Imagine a rock solid, private bank, led by a reputed and prudent banker. While much of our world is yet to come out of a financial crisis caused by irresponsible bankers, who were ultimately bailed out at huge cost to taxpayers, there's this guy in Venezuela, trying to avoid a government-led raid on his bank's funds. His name is Oscar Garcia Mendoza, the bank he directs Banco Venezolano de Crédito (BVC), and the assault he's trying to fend unprecedented. Since 2011, Venezuela's Central Bank has been lowering reserves requirement (or liquidity ratio). The aim is to free cash held with the Central Bank, so that private banks can in turn purchase government bonds issued to fund housing projects (Misión Vivienda). In four separate issues since 2011, the Chavez regime has raised in excess of $9 billion from Venezuela's private banks. So far, so capitalist, right? Not quite, financial institutions that refuse to risk it with Chavez bonds are effectively penalised by an unexplainable increase in liquidity ratio. Garcia Mendoza leads the only “non-compliant” bank. He is challenging the punitive measure in Venezuela's kangaroo courts. So what's Chavez to do, with the oddity of a responsible banker, trying to protect his clients' money? He will probably be made an example, just like RCTV. Locally, there's not a single chance that chavista judges will rule in his favor. But how about assets and funds held abroad? Enter Derwick Associates. Derwick Associates shot to fame in August 2011, when Cesar Batiz, an investigative journalist working at Ultimas Noticias (Venezuela's largest newspaper), exposed Derwick's inexperience and lack of track record, in relation to 12 public contracts for procurement and installation of power plants awarded by the Chavez regime in a 14-month period. In September 2011, Batiz published a second article, where he exposed overpricing in the contracts. Two days later, the editor of Ultimas Noticias, Eliazar Diaz Rangel, formally requested that the Venezuela's Comptroller's Office launch an investigation into the affair. The story was to take another twist though: a telecom impresario tried to bribe Batiz, offering hush money and shares of CodigoVenezuela.com, a site critical of the Chavez administration. Batiz then introduced his own FOIA-like request with the Supreme Court, after failing to get any information about contracts from chavista officials. Predictably, judges quickly dismissed Batiz’s request. So why would an obscure, fly-by-night company have the temerity to sue Venezuela's most solid bank and its CEO? In Florida? How come none of the other parties that have either republished, or expanded on Batiz's original investigation, been sued by Derwick anywhere? The corruption trail goes cold once it reaches the Chavez government. Other investigations related to previous corruption scandals led nowhere. Prior to the Derwick caper, its founder, Alejandro Betancourt Lopez, was the star in a different scandal involving a “lost” $500 million wire. His fax number was used to issue the instructions to wire $500 million worth of payments to a numbered-account in Gazprom Bank Lebanon controlled by Rodolfo Sanz, former head of Corporacion Venezolana de Guayana. Betancourt’s Gazprom connections already speak volumes about the man. The most plausible explanation, in my opinion, is that Team Chavez is orchestrating the whole thing, for financial and political reasons. The first clue, is the decision by Venezuela's Central Bank to target “non-compliant” banks, read Garcia Mendoza's, by imposing a 6-point liquidity ratio increase, forcing a huge spike in cash held by the Central Bank. Refusal to purchase Mision Vivienda-bonds could, potentially, end up costing Garcia Mendoza's bank hundreds of millions in loss revenue from funds that could have otherwise been used for more sound investments with higher returns. Purchase of bonds is equally risky, for what official institution will guarantee funds and returns if the regime decides to default, or renege his debt with Venezuelan banks? A no-win situation. The second clue to this working hypothesis are statements from Jose Vicente Rangel, former VP of Venezuela, trusted advisor and confidant of the caudillo, taking Derwick's accusations against the banker at face value, repeating it almost verbatim. It would appear that chavismo has already taken sides in this dispute. Rangel, however, went further, and announced that Derwick would also sue Garcia Mendoza and Venezolano de Crédito in Venezuela. 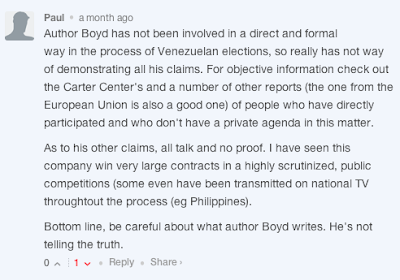 How can he be privy to such information, when not even those accused by Derwick in the Florida lawsuit are aware of legal actions against them in Venezuela? Rangel is a Chavez enforcer and Venezuelans know that Rangel’s TV programs are a taste of what the government is thinking and where the sabres are rattling. Garcia Mendoza could well find himself in the near future with a besieged bank on its way to expropriation. The $300 million defamation suit is likely to fail, inasmuch as truth is a defense to libel, and Team Derwick has a lot to lose in any discovery process -their connections to Davos International Bank may surface. With their lawsuit, Derwick has unnecessarily alerted the American authorities that they want high profile attention. American authorities would do well investigating Derwick Associates sudden wealth and use of US stream of commerce instead. The lawsuit has opened a wide door for that. Special attention should also be paid to Chavez attempts at using the US judiciary to: a) corner his critics, and b) misappropriate millions of dollars through proxies. If the Venezuelan State is afflicted by a housing crisis, which it is, surely the solution, after nearly a decade of record oil prices, ought not be to raid private banks. The whole thing is a disgusting travesty, monetary mechanisms used in perverse ways to punish, an abuse of courts' roles. Beyond probable violations to recently revised Foreign Corrupt Practices Act, Derwick was incorporated in Florida after all and has business relations with American companies (ProEnergy Services and FTI Consulting for instance), it seems unthinkable that individuals with such disreputable credentials can take advantage of the US legal system to advance their fraudulent agendas under the guise of defending their reputations. Cesar Batiz collaborated with this article.